Paul Guerrero (November 5, 1931–March 3, 1989) had an extensive career as not only a professional drummer and musician, but also as a teacher. Born in New Braunfels, Texas, to Mexican-American parents, Guerrero served as a drummer for Woody Herman’s band, Stan Kenton’s band, the North Texas One O’clock Lab Band, and the 4th Army Band. He also performed with major artists such as Henry Mancini, the 5th Dimension, Dean Martin, Sonny and Cher, Chet Baker, and Charlie Barnet. Guerrero earned a doctorate from North Texas State University, eventually spending much of his teaching and performing career in the Dallas area, where he taught at North Texas State, Southern Methodist University, and Richland College. Not only was Guerrero a drummer for the Dallas Symphony Orchestra, but he also served as a member of the Board of Directors for that organization. Throughout his extensive career of both live and recorded performances, Guerrero endorsed Sonor drums and Evans drumheads. 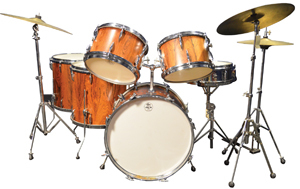 This set, a 6-piece “New York” model Sonor kit, dates from about 1970 and consists of an 8 x 12 tom, 9 x 13 tom, 16 x 16 floor tomGenerally the deepest tom on a standard drum set. It sits upright on 3 legs., 16 x 18 floor tom, 14 x 22 bass drumThe lowest pitched drum in a marching band or with a drum set. 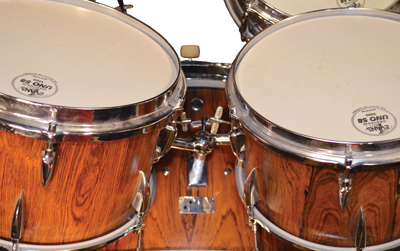 A two-headed drum, it is usually..., and a 5 x 14 snare drumOne of the more common drums in marching bands and drumlines and the primary drum of a drum set... (model D-426). 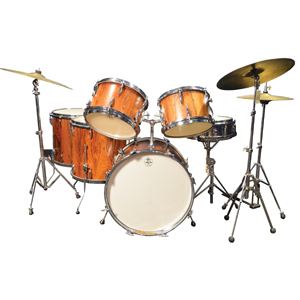 The toms and bass drumA hollow cylindrical shell of any size that has a head stretched over one or both ends and is b... are constructed with 6-ply beech shells and covered with rosewood in a vertical rather than horizontal direction. The drums are equipped with Evans UNO 58 heads. This kit also features “slotted” tension rods and a “rifled” surface on thumbscrews for the hardware, as well as Sonor’s characteristic staggered, “teardrop” lugsThe tension rods (or screws) that hold the hoop and drumhead onto the drum. for the toms. The kit’s hardware is comprised of two cymbalA copper/bronze (or variation of metal alloy) disk struck with a drumstick or crashed together ... stands, a hi-hatA piece of the drum set, consisting of two cymbals mounted on a stand. The cymbals are opened a... stand, a double tom mount, snare stand, and bass drum pedalThe pedal used to play the bass drum on a drum set. . In addition, Celeste Guerrero donated three pairs of sticks and brushesA type of mallet that consists of fanned-out wire bristles and are typically used in jazz drumm..., an additional 12-inch mounted tom, and the throne used by her late husband, which are not shown. 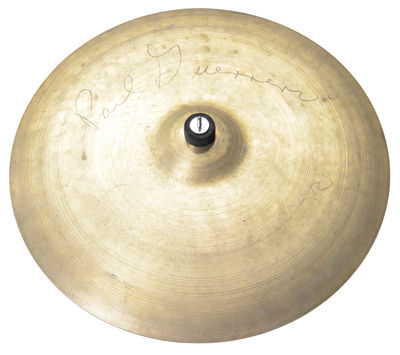 Two Zildjian ride cymbals (both 20 inch) and a pair of 15-inch thin Zildjian hi-hat cymbals are each autographed by Guerrero.